We are in the process of building a house, high up on a mountain, overlooking the valley and with enough sheep covered fields to satisfy even the most ambitious border collie. It is a two storey affair and the two levels used to be connected by a concrete staircase. Concrete because of fire and sound properties not equalled by wood. 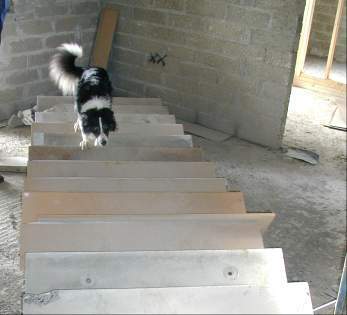 Tudor, the Border Collie who shares his life with us took to this new structure like a duck to very wet water. 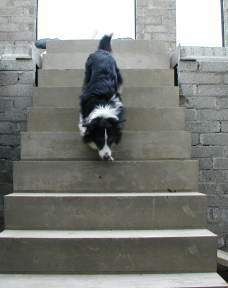 Every time we were up on the site he raced up and down the staircase until he made everyone dizzy. Whether this enthusiasm was just simple pleasure in running up and down stairs - a thing new to him - or if it had something to do with the excellent view from the balcony over the yow and corbie infested landscape I do not know. Unfortunately there was a problem with the staircase. The manufacturer had got their numbers wrong and every step pointed upwards by a slight angle, so one fine day a huge crane, a lorry and a man wielding a motor driven concrete cutter arrived to put things right. Inevitably their new measurements were as bad as the old ones had been and after an hour's work they ended up dumping the now useless staircase flat on the ground floor. As one of the men from Roespan commented dryly, before he left the scene of the crime: "If those boys could only get their measurements right, they would make a lot of money." He was of course talking about the boys in the planning office. Next day we arrived with Tudor to inspect the damage. Our builders - some of them Tudor's best friends - were looking down from the upper floor. We couldn't join them because the stretched out staircase was lying flat on the ground and there was no ladder. Tudor of course wanted to say hello to his dust covered buddies and he looked around for the familiar way up. His understanding of the "Theory of the Principle behind a Staircase" was quite sound: You start at one end, you walk along all the bits in-between and when you hop off the other end you are upstairs. Today the structure looked slightly different because it was lying flat on the floor but in Tudor's doggy mind the principle was bound to be exactly the same. Without hesitation he started at what used to be the bottom of the stairs, walked right across the length of the staircase and looked very surprised when he reached the other end and found himself still at ground level and not upstairs. He pretended not to have noticed and tried again: Hop on one end, walk across, hop off the other end and look down. It still didn't work. His next reaction was obvious. Something wasn't right, hence it must have been those two great big idiots he lived with and who always changed things around - and they were bound to blame him! He rushed over to us and apologized profusely. In Tudor's case an apology is worse than the crime and can be quite painful. Finally he wagged a bushy tail at his friends above and went off to look for his football. The little black and white criminal obviously hadn't understood the elevating science behind the basic purpose of the modern stairscase. He just knew that in order to get up high, you just had to use the structure, no matter in what position you happend to find it. A dog psychologist could possibly have learned a lot from Tudor's strange behaviour, we just laughed and came to the conclusion that there are at least two ways to look at anything.